Charms Valentine mini pops. Everyone's favorite charms pops now come in a bag of just cherry flavor with fun messages of love on the wrapper just for Valentine's day. Charms mini pops are the perfect size to attach to your Valentine card for your Valentine Exchange. Unlike many candies charms Valentine mini pops are made in the USA. The are also manufactured in a facility that does not use gluten, eggs, tree nut or peanuts. 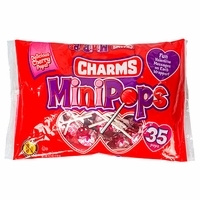 Buy your Charms Valentine mini pops today, each bag has 35 mini pops all in cherry flavor.